Atiku described Buhari as incompetent in handling the countryâ€™s affair, saying the task of making Nigeria work again is a collective effort of all Nigerians and asked them to vote out Buhari in 2019. Atiku, the traditional title holder of Waziri Adamawa, further explained that Nigeriaâ€™s economy is in a sorry state and promised to tackle it headlong, adding that youth unemployment is another bane of the country, promising to create jobs for the teeming youths and improve on power supply. He added, â€œWe have seen four presidents, from Obasanjo to our late brother, Yarâ€™Adua, to me; and to the current president. You have seen how the various presidents and the various parties have worked, and one thing that is very clear is that PDP is still the number one party. According to the former president, â€œLet us not make any mistakes, those of us that are adults, old enough to vote, if we vote wrongly, our children and grandchildren will not forgive us. Today, our country has a lot of challenges; look at all the presidential candidates, all of them are good people, but among all, we have seen that it is only Atiku that can deliver. â€œIf you have a soccer match, you go with your best 11, you donâ€™t manage, if you have a wrestling or a boxing tournament, you go with your best, you donâ€™t manage. He said, â€œToday is a great day, today we are making history. As the Director-General of the campaign, when we said we wanted to come to the North-west, they said it was a no-go area for PDP, but today, North-west is PDP. According to him, â€œThe man that can bring food to the table, the man that can fight security, the man that can unite Nigeria, Atiku Abubakar. â€˜â€™It is about food, security and we will vote Atiku Abubakar because he understands it, he knows how to make good choice, he knows how to make things work, he knows how to unite Nigerians, thatâ€™s why we will vote him. While also addressing the rally, the Speaker of House of Representatives, Dogara, said Nigeria is not safer today than it was in 2015, saying the nationâ€™s economy has since deteriorated, asking the people to kick out the Buhari administration. The national chairman later presented the partyâ€™s flag to the presidential candidate and the governorship candidates from the zone. 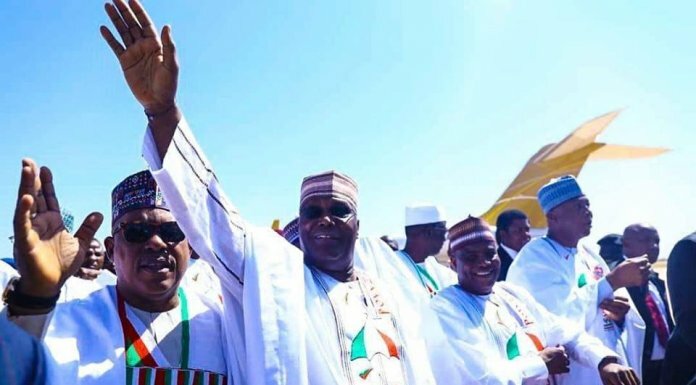 Meanwhile, the PDP Presidential Campaign Council (PCC) said last night that the mammoth crowd of supporters that received PDPâ€™s presidential candidate, Atiku at the North-west presidential zonal rally in Sokoto, was a clear demonstration that Nigerians across the board have reached a consensus to vote Atiku in as the next president of our country. In a statement signed by the council spokesman, Ologbondiyan, the campaign council appreciated and commended the courage and show of patriotism by the people of the North-west â€˜â€™in rejecting President Buhari and sectional politicsâ€™â€™ to support Atiku, in keeping with the collective quest to unify the nation and revamp the nationâ€™s ailing economy. It said, â€˜â€™Atiku Abubakarâ€™s acceptance by the North-west establishes the common feeling among Nigerians that he embodies a practical solution to the myriad of problems brought upon our nation by Muhammadu Buhariâ€™s incompetent, divisive, repressive and insensitive administration.